Silverstone Circuits Limited, and its owner the British Racing Drivers' Club (BRDC), today unveiled and launched the new Silverstone Grand Prix circuit. His Royal Highness the Duke of York, KG, UK Special Representative for International Trade and Investment, formally cut the ribbon to open a major new section of track that represents the first stage of a multi-million pound investment in the Home of British Motor Racing. As part of the launch ceremony, His Royal Highness helped to inaugurate the new 3.66 mile circuit in the passenger seat of the Santander two-seat Grand Prix car driven by former World Champion, and President of the BRDC,Damon Hill OBE. On track at the same time were F1 driver-turned broadcaster David Coulthard, driving a Red Bull Formula One car, and the motorcycling father-and son combination of Ron and Leon Haslam, representing the worlds of MotoGP and World Superbikes. The 500 guests at Silverstone to witness the formalities included many luminaries of British motor racing, local dignitaries, motorsport governing bodies, BRDC members and media. The guests were positioned in a grandstand overlooking the new section of track at ‘Village Corner', where the ceremony took place. After the formal proceedings, a number of guests had the opportunity to be driven around the circuit by the BRDC ‘Superstars' up-and-coming drivers. Motorcycle media were due the opportunity to take to the track on two wheels, but the fine morning weather that had greeted guests turned to afternoon rain and their session was cancelled. 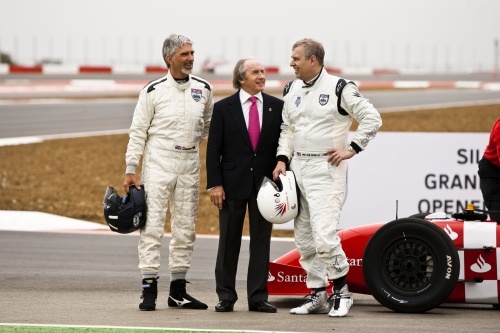 “This is a very proud day for Silverstone Circuit and the BRDC,” commented Damon Hill. “The new section of track and improvements made elsewhere to the circuit are fantastic. These changes provide not only a stunning new driving challenge but will also lead to an enhanced spectator experience and provide great flexibility in terms of the different layouts that we can now use. For Richard Phillips, Managing Director of Silverstone Circuits Limited, today's launch represents an important stepping stone in the redevelopment of Silverstone. “This new Grand Prix track combined with the redevelopment of Stowe Circuit and facilities, that was also completed this year, are a very exciting part of our overall redevelopment plan,” he said. “Work has already started on a new pit and paddock complex that will be completed in 2011 and we feel we are well on the way to being one of the best motor sport facilities in the world for competitors, organisers and spectators alike. At the same time the redevelopment will help us to diversify our offering in the areas of leisure, education and creating a technological hub for motor sport that will ensure that Silverstone remains a vibrant and healthy business for many years to come.